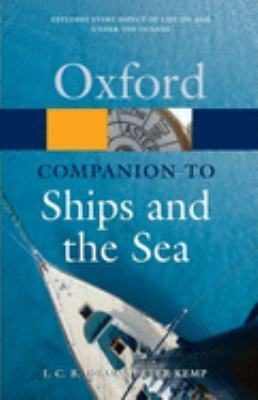 The most comprehensive and authoritative reference book of its kind, The Oxford Companion to Ships and the Sea is a completely revised and updated edition of a classic volume that was first published in 1976, to huge acclaim. It brings together more than 2,600 entries on every imaginable aspect of the seas and the vessels that sail on them, from shipbuilding, yachting, diving, and marine mammals, to tidal power, piracy, and the literature and language of the sea. The Companion includes authoritative and fascinating entries on maritime history, including its greatest naval battles, like Pearl Harbor and Trafalgar, its most well-known ships, and its most famous individuals, both real and fictional. This second edition provides significant new material on topics that have come to prominence in recent times, such as oceanography and marine archaeology. Key contributions on these subjects include climate change, environmental issues, marine pollution, and marine wildlife. Among the many brand new entries to this edition are up-to-the-minute articles on underwater vehicles, tsunamis, warfare at sea, the Economic Exclusion Zone, and ship preservation. Entries are fully cross-referenced, and the text is now illustrated with over 260 detailed drawings, making it more accessible than ever before. It will prove an essential point of reference for anyone with a professional or amateur interest in the seas, from yachtsmen, maritime historians, and oceanographers, to naval architects, environmentalists, and armchair sailors.